Having just moved into a house, we've had to seek the service of various local companies - a plumber, a sprinkler service, a lawn and landscaping service, a concrete contractor, and, unfortunately, a tree service, the latter to remove some large trees from the property. Let's get this straight, they can remove trees. Of course, during that part of the operation the boss/owner was there. Though he didn't identify himself as such, he was operating the crane. Unfortunately, when his work was done he left, leaving the stump grinding to his son and his crew. They don't have the same sense of honor nor the impulse to do good work as the owner. Not realizing this, I was operating under the premise that they wanted to do a good job for me. 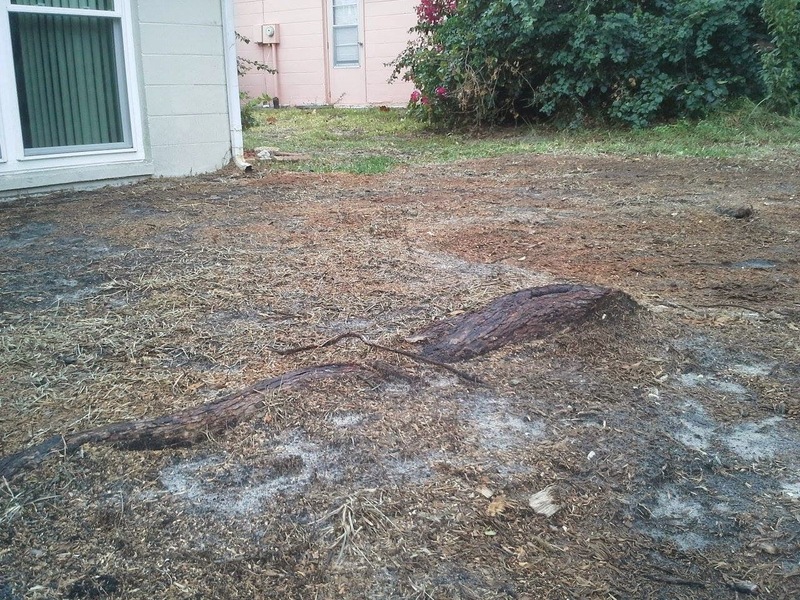 That's why when their foreman Sean approached me and suggested that instead of hauling away the chips from the biggest tree, a camphor tree, it might be a good idea for him to spread them around so the lawn, once sod was placed on top of the chips, would slope away from the house. It sounded like a good idea to me, so I said okay. That was a mistake. 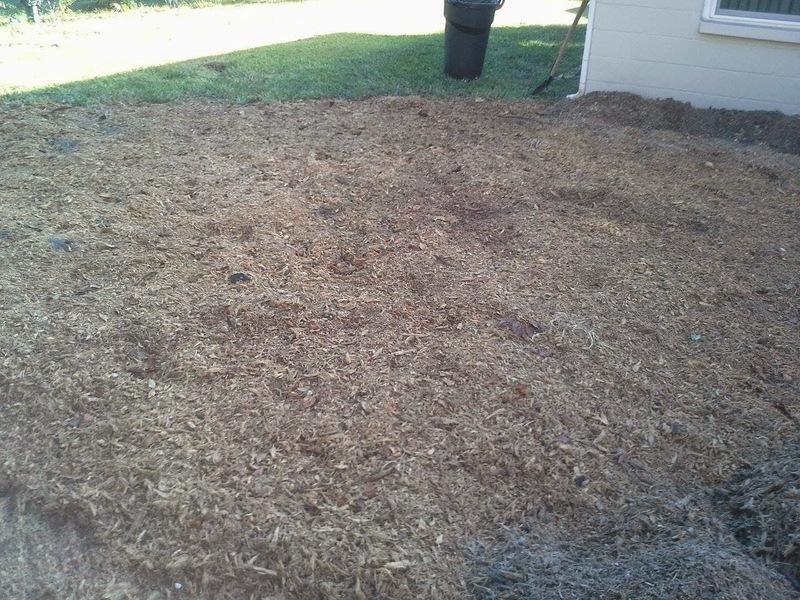 One, I didn't realize the mass of chips that stump and its roots would produce; and two, I didn't realize, as my landscaper later told me, that sod would not grow on top of the camphor chips and that it would take 5 or 6 years for the chips to compost. My landscaper figured that PTCS had just been trying to save the cost of disposing of the chips. I think they were just lazy. BTW, did I mention that they covered a few of my sprinkler heads? Anyway, I called the company and explained that my landscaper had told me the chips would have to be hauled away before sod was laid down and wondered if they would come back and pick up the chips. I was told they would get back to me, but they didn't. They weren't inclined to come back. Why should they? They had been paid their $2,000+. And this article: How to Plant Sod Grass Over Tree Stump Grindings which suggests you "Remove any large wood chunks or sticks from the area. 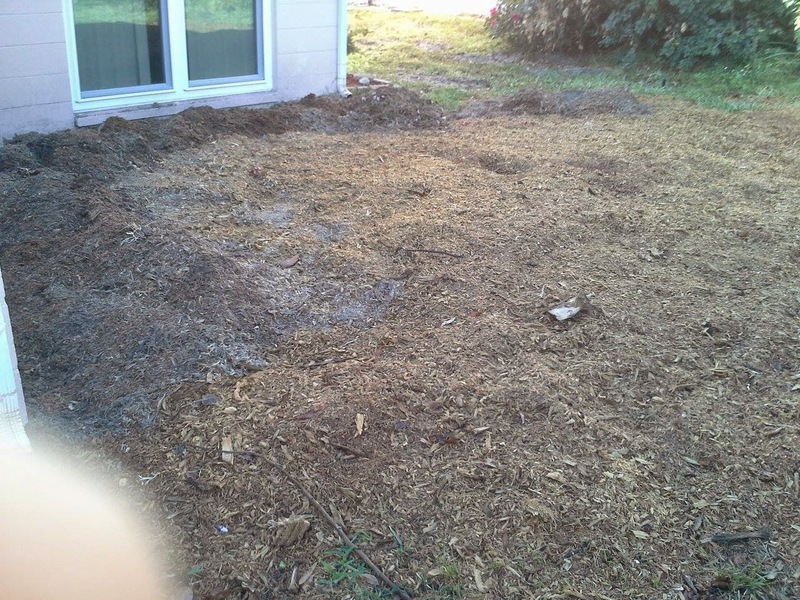 Remove as much of the wood chips and sawdust as possible and work the remainder into the soil." So, I asked my landscaper to remove the chips. He and his two helpers did so for $275. In the process of removing the chips they uncovered parts of the tree, roots and stumps, that hadn't been ground down below ground level. He suggested I call PTCS and tell them to come back and finish the job. I called and was told by the girl who answered the phone that she would get back to me after she conferred with the men. She didn't get back to me. Before I called again, I emailed them some pictures. That produced the desired effect. The boss came out to examine the unfinished job and told me they would be out the next day to finish the job the way it should have been finished the first time. They did. I was so pleased with the outcome that I was tempted to give this review a slight boost but, in his haste to leave the property, the foreman ran over a lawn sprinkler that he had been told he had to avoid. As a consequence, I continue to rate them "Avoid". If you do decide to use them, do so with caution.